Communicating effectively at work is often harder than it should be. Even if we are comfortable expressing opinions and sharing ideas, we can sometimes be misunderstood or even ignored. We may think we are getting our point across, but various factors can block our messages from being accurately understood. Long-winded rambling with no specificity or taking far too long to share project directives for team members. The result is that they deliver on cherry-picked elements of the project, and continue to miss the mark on outcomes. Talking at instead of speaking with team members. Rattling off orders can feel condescending and it is the most uninspiring way to communicate with a team. Saying “I’ll get around to it….” but never doing so. Team members shouldn’t have to chase you down to get instructions for projects or details regarding deliverables. Don’t worry, we’ve all been there and done that too! Here are 3 strategies to drive effective communication within teams this year that will make long, unproductive meetings a thing of the past. In 2019, let’s be concise with our messages to reduce the chances of them being misinterpreted or misconstrued. Adding too many (and often unnecessary) details increases opportunities for miscommunication, so focus on delivering pertinent information as quickly as possible. Speak to the group but address individuals. When discussing a task with the team, address each team member individually to confirm understanding of the project scope, any amendments to it, and deadlines for deliverables. Ensure that everyone understands the role they will play in accomplishing the overall project so they can start working on respective tasks with zeal. Summarize key points and deliver them first. Need to share a lot of information? Always start with a ‘cliff notes’ version. List the highlights and address them first, and then go into detail on each of those points. Often, not everyone contributes to conversations in conventional meetings because a few alphas dominate the dialogue while others sit back, sometimes harboring resentment and discontent. Often, tough topics are brushed over or turn into arguments with nothing being accomplished. Moreover, it is a lot easier to communicate when times are good, but what about when a deadline is approaching and there are challenges halting our progress? This year, let’s remove these roadblocks halting us from communicating clearly under pressure. Let’s create a work environment where every team member is able to relay pertinent information about projects and deliverables, so even the tough stuff gets discussed. Transparency is great but information overload is not. Not all team members need to be included in every meeting. Take a look at the meeting’s agenda and ask, “Who does this impact? Who needs to know this and who is involved?” Choose wisely, and respect the time of team members that don’t necessarily need to attend that meeting. A simple ‘highlights’ email or message thread on an announcements channel in Flock (a channel with all team members automatically added to it where only the admin can share information) gives every team member the opportunity to keep themselves informed at their own pace. Get to know each individual member of the team and understand their style of communication. Are there any introverts in the team? Every team member has something to offer. By knowing our people, we can communicate with them more effectively as well as find ways to strategically harness their many talents. Effective meetings have an agenda and a time limit. 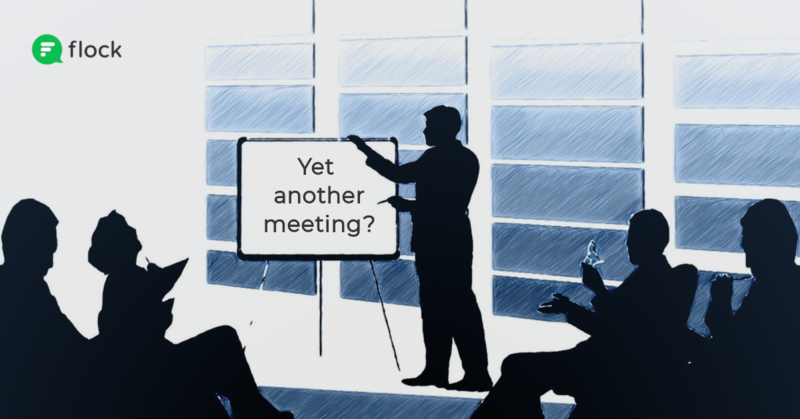 The agenda sets expectations for the meeting, but outside of the meeting space, it is equally important to make sure our expectations are articulated well enough that everyone is on the same page as far as deliverables and deadlines are concerned. Wrapping up a meeting does not mean that the discussion is done and there’s nothing else to do. In fact, the post-meeting follow-up is a great opportunity to verify that everyone involved walks away with a clear understanding of what is expected of them. Sending a follow-up message to all participants ensures that they have a better understanding of all the takeaways from project review meetings. Let’s apply this meeting management strategy to all our meetings in 2019. From a one-to-one conversation with a team member to a group discussion on a project, let’s ensure that we follow-up on every meeting. It can be something as simple as a quick message on Flock or an email or, for group meetings, a follow-up message in the group’s channel! When managers work to reduce the need for mindless meetings, team members know that their talent and time are respected. By focusing on message delivery, opening clear channels of communication, and following-up on meetings, we can clear roadblocks to effective communication and build happier, more productive organizations. Ones where exchanges between teams and among team members are harmonious and everyone is empowered to communicate and collaborate effectively. Let 2019 be the year where effective communication flows drive productivity in our organizations and help us create a collaborative team culture. What strategies do you use to improve communication flows in your organization? How do you manage meetings and follow-ups in your team? Let us know in the comments below. Cheers!